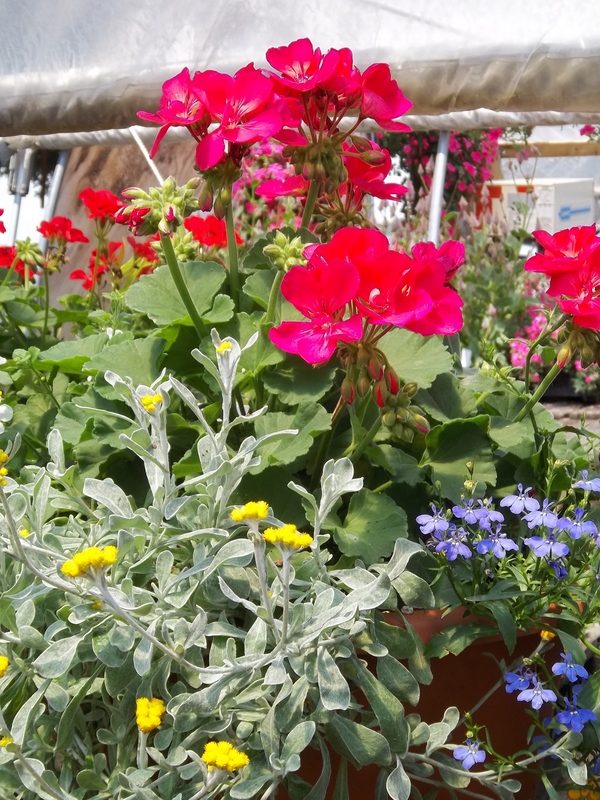 I decided to stay a little closer to home this week, so I headed for Wiltse’s Greenhouse and Farm in Maple Park Illinois. This is close enough for regular shopping if you live in Kane County like I do. It’s 14 miles west of Geneva on Route 38. 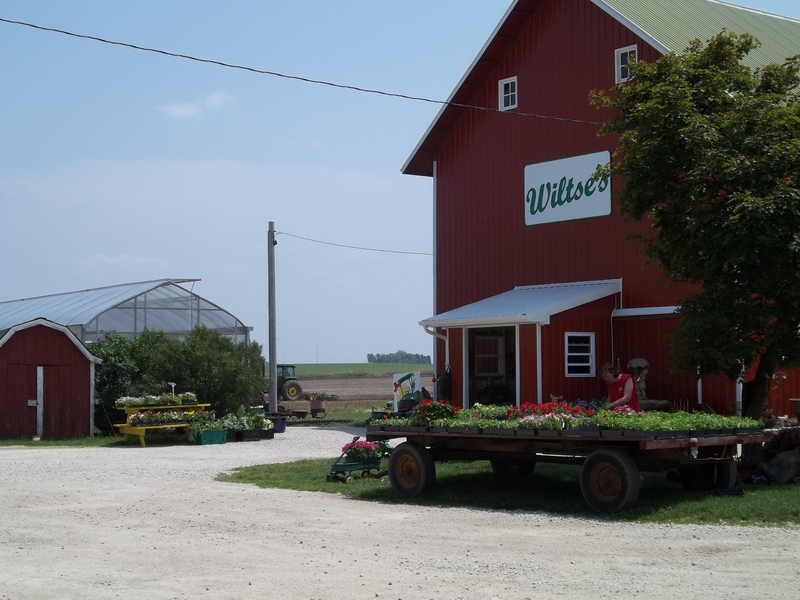 Wiltse’s sells fresh produce, eggs, garden art, perennials, annuals, herbs, and runs a “U-Pick-It” operation on sixty acres of prime farmland. It is a fourth generation family farm and several family members work there. 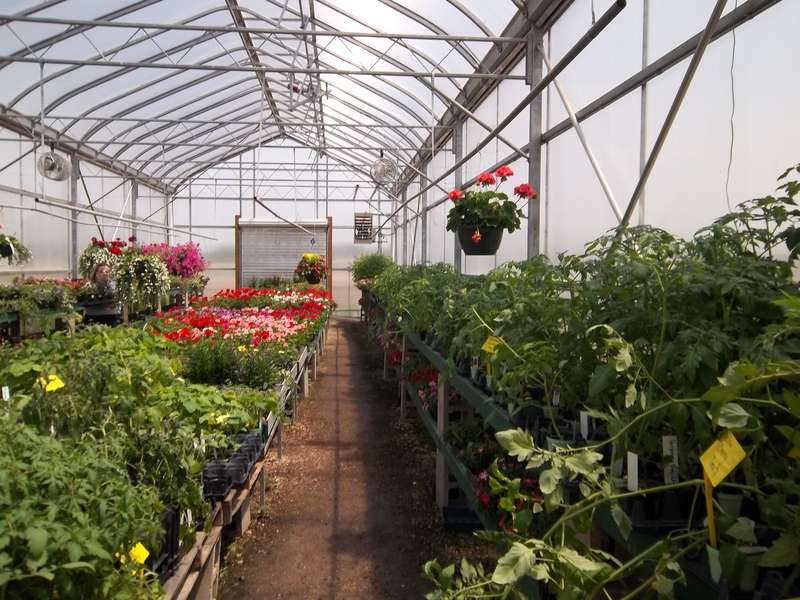 My appointment was with Kate Wiltse, who runs the greenhouse operation. I arrived earlier than planned, because thunderstorms were in the forecast and frankly, I am weary of posting photographs backed by gray skies and ominous clouds. Saturday was a gorgeous, hot June 4th and I was grateful for it! We had about six inches of rain here last week, and there were new ponds everywhere to prove it. As I drove west, the sun was blinding and the fields that weren’t flooded were plowed and planted. I pulled into the gravel lot and parked the Guzzler next to a good-sized greenhouse. Since I was early for my appointment, I took some time to explore and take some pictures. 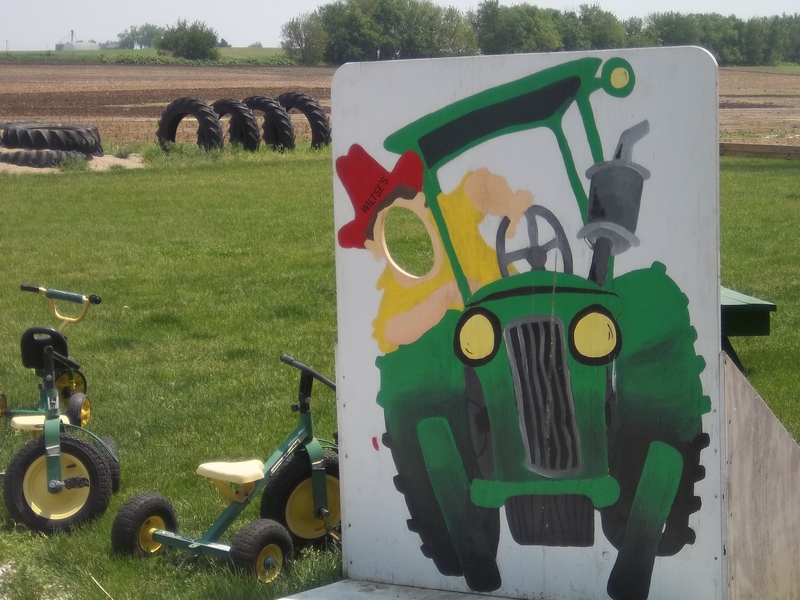 At the entrance to the greenhouse, there was a collection of toy John Deere tractors for little visitors to ride. There were small pots of succulents in front of the greenhouse; hens and chicks, only $1 per pot! It was perfectly, steamy hot in the greenhouse. 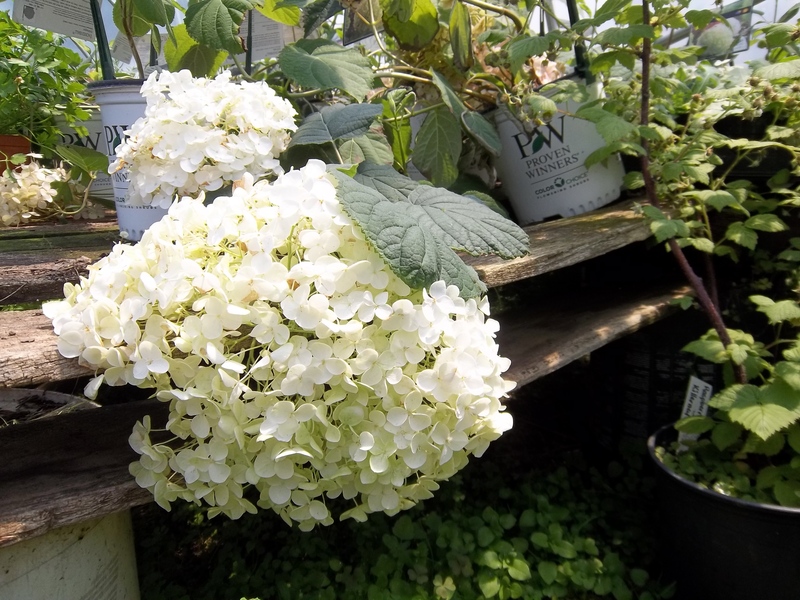 (As my friend Elizabeth said recently, “You can take the girl out of the South…”) I began to glisten in the humidity as I strolled among the annuals and vegetables. Glisten is Southern for sweat – doesn’t it sound more attractive? 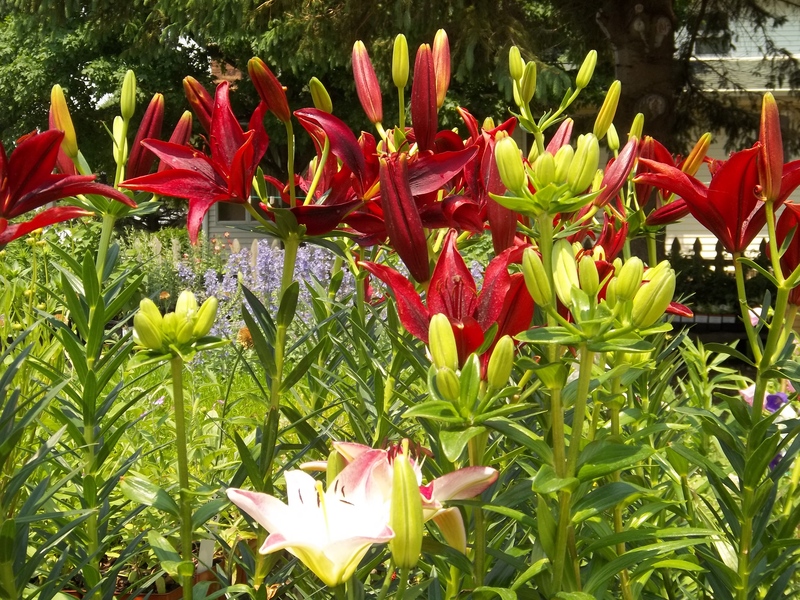 I loved the smell of earth, the damp air, the explosion of color among the flats of annuals. 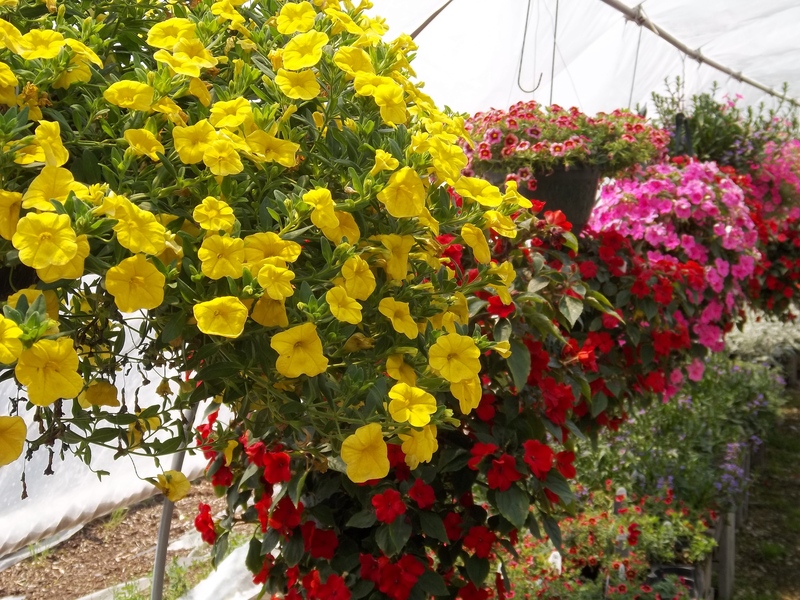 If you are a gardener… get on out to Wiltse’s, pronto! They have a wonderful selection of tomato and pepper plants ready for planting. The names of the heirloom tomatoes alone made me hungry; Cherokee Chocolate, Arkansas Marvel, Red Pear Piriform, Big Zebra, Rose, Striped German, and Granny Smith. Yum! Carolina Gold, Tomatoberry, and Cherokee Purple, too. The usual hybrids were available; Big Boy, Yellow Cherry, Beefsteak Ponderosa, and Husky Red. The names of the peppers were pretty charming: Tobasco, Seniorita, Chocolate Bell, Ancho, Sweetheart, Cajun Belle, and Carribean Red. Key Largo, Aristotle, Mariachi, Cubanelle, and Cayenne. A summer squash called Sunray and a finger eggplant called Hansel. There were cucumber plants, the regular and the pickling kind. Don’t you want a big, crisp, chilled salad NOW? If you are an eater, get on out to Wilte’s! This week they have fresh asparagus, broccoli, and eggs. 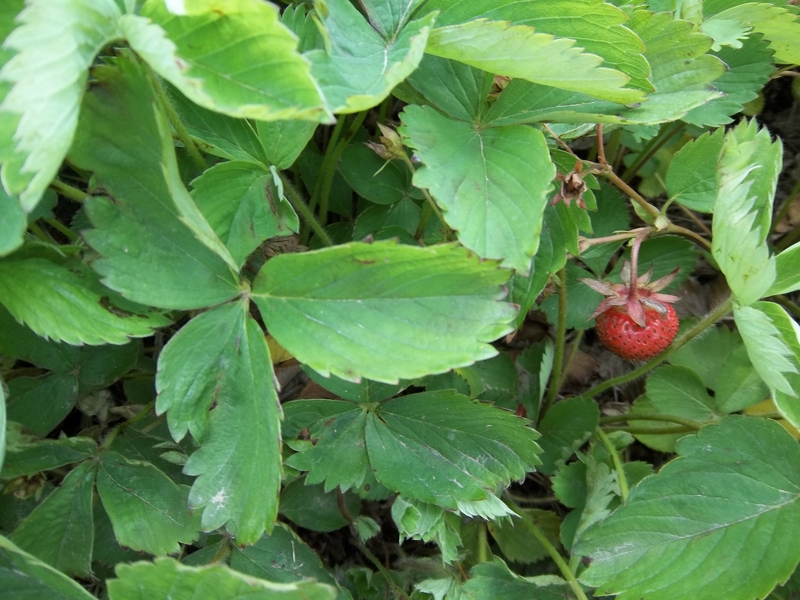 The U-Pick strawberries have just begun to ripen this week. Take the kids out to see where food really comes from and let them pick their own berries. You won’t regret it. You can see the new strawberry peeking out from under a leaf here in the photograph. And John and I had asparagus last night for dinner, steamed quickly until crisp with a little butter and sea salt. Outstanding! Anyway, the first greenhouse was excellent, so I was ready to explore the other buildings. I walked from the greenhouse to the requisite, pretty red barn. 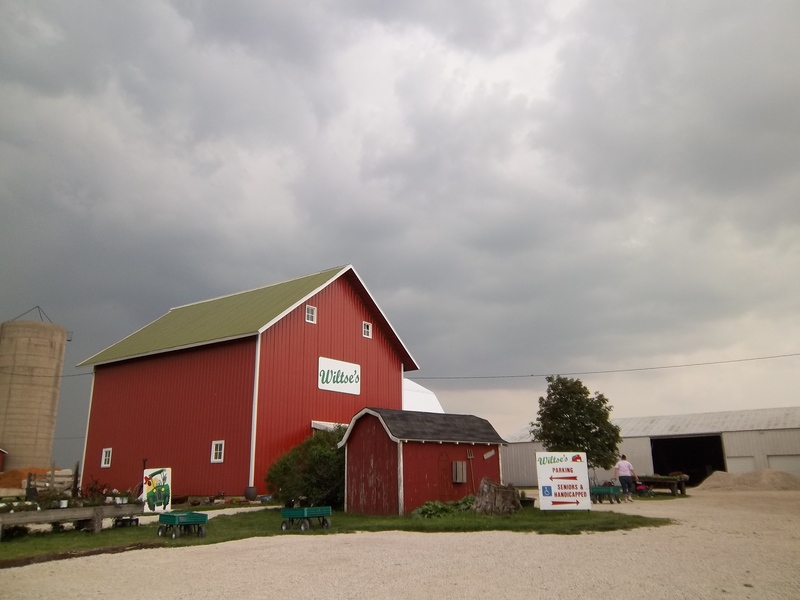 At Wiltse’s, the barn holds the retail operation. I walked into the dark barn and had to wait a minute for my eyes to adjust. 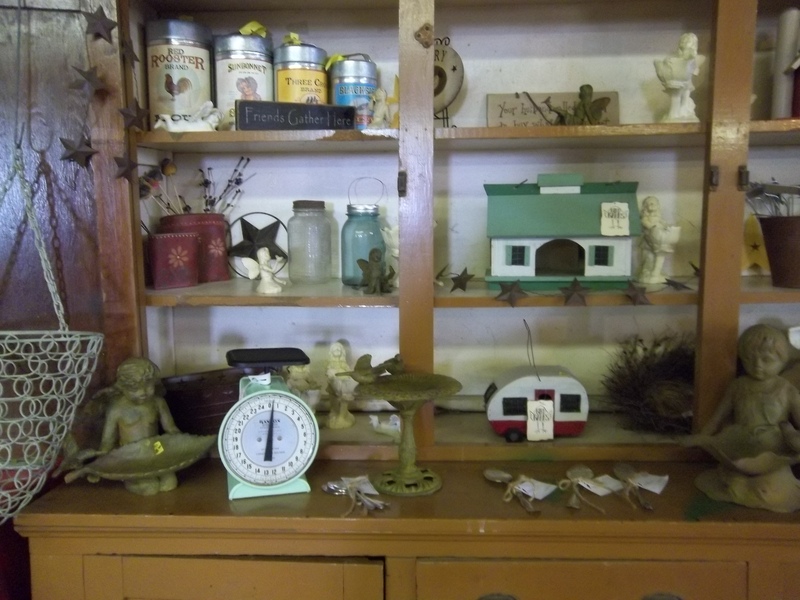 The barn has a nice display of gardener’s goodies; tasteful, not tacky. 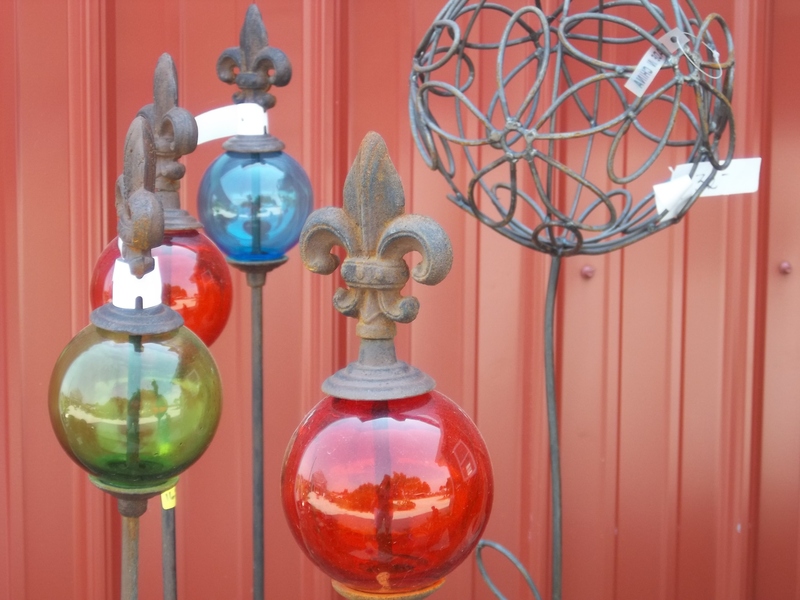 I should have asked who purchased the goods for the retail operation and thanked them profusely; for there were no wide-beamed, polka-dot, muumuu wearing wooden cutouts posing as yard art. There were some nicely glazed, clay pots. Some birdhouses, wire planters with coconut moss cut to fit them. Produce and eggs for sale. Impatiens in hanging bags, in the shade of the barn. A very cute little cast iron pig in the doorway to greet visitors. Some nice rustic trellises and ornamental iron work. A sweet little black cat wandered in and let me pet her, but I couldn’t find her price tag, so she is still there. Kate’s Mom, Marie was working the counter. I introduced myself and we chatted a bit. Turns out Marie used to babysit for an adult fellow I work with now. I confess that I tried to get the childhood dirt, but Marie didn’t give me much. She did say that his brother was… something. The way she raised an eyebrow did not lead me to believe she meant angelic. I of course shopped as I wandered. (Shopping is a true skill and I was born with it so I use it.) I got a gorgeous clay pot. It’s about 14″ tall and 12″ across and it was on clearance for $18. Sweet! The top half is glazed in taupe with purple undertones and the lower half is blue. To fill it I bought dark green lemon thyme, purple and lavender phlox, and two ornamental cabbages. The cabbages are soft green with purple in the middle of each leaf, but one is smooth and the other ruffled. This combo should last until November in a protected corner of the front porch. I also got a couple of bundles of asparagus, and a Cherokee Chocolate tomato plant. I got an unlabeled tomato plant, too. I considered inquiring about it, but decided to let the fruit be a surprise! I kept an eye out for Kate as I made my selections. I hoped to catch her when there was a break in the action. I am pleased to report the place was steadily busy, yet never crowded. When Kate had a break, I introduced myself. Kate has a sparkly personality, bright blue eyes, and a great laugh you can hear from across the way. She told me that the farm was bought by her parents after they married. Her Dad passed away in ’86 and her Mom, Marie has run the farm since; along with Kate, her brother Joe, and her sister Patty. Several nieces and nephews are joining the business as they reach the teenage years. The farm has held a spot at the Aurora Farmer’s Market on Saturday for many years. Stop by if that’s closer for you. It’s near Payton’s Roundhouse on Route 31. As we were talking, a couple walked up and Kate stepped away to help them. I heard the woman say, “The rabbits ate my dill. All of it.” Kate assured her it would grow back, but she couldn’t wait. Dill emergency! I understand the Dill Emergency, my sister had one just this past Sunday. Kate was back a few minutes later and told me she began the greenhouse operation about 11 years ago, originally to start the tender produce plants, so they could be hardened off gradually as weather permitted. It seems to have taken on a life of its own, this green house thing. 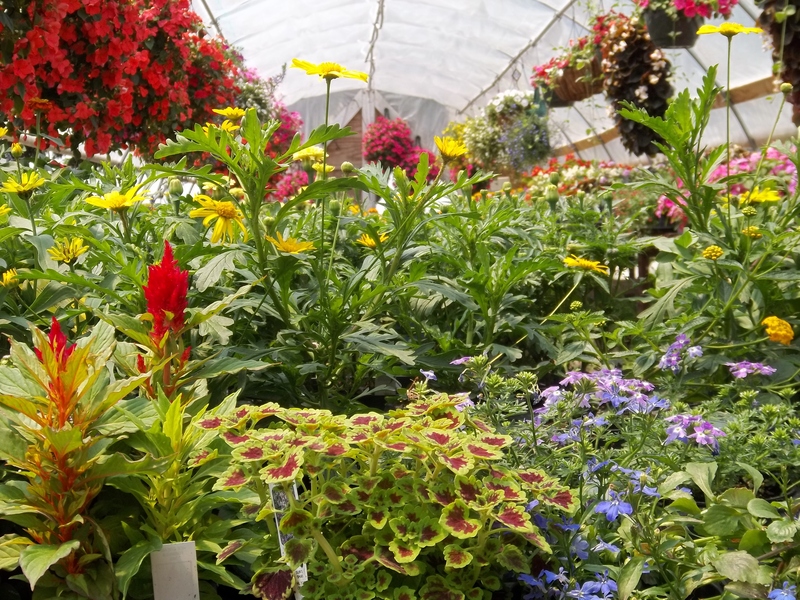 Kate gave Prosek’s Greenhouse in Winfield a shout out, so I want to mention them, too. She said they have shared knowledge and equipment freely, and she appreciates it. Perhaps a visit in my future? Besides the greenhouses, there are 60 acres for produce they sell in the retail operation; white and bi-color corn, tomatoes, onions, potatoes, green beans, strawberries, cabbage, broccoli, lettuce, 3 varieties of peas, radishes, carrots, beets, cauliflower, zucchini, yellow squash, pattypan squash… What a list! 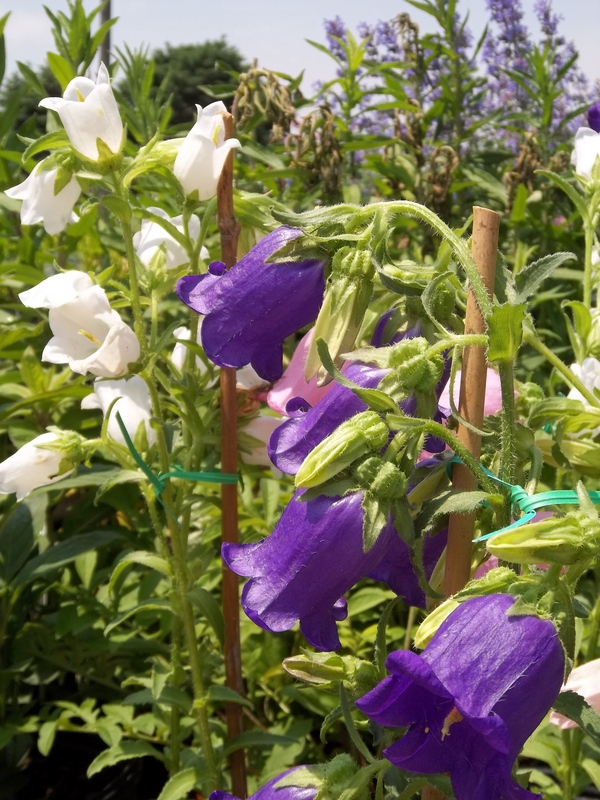 This year, there will be a cutting garden for flowers (love it!) and a U-Pick tomato field. Hurray! My idea of heaven is to stand in hot sun, barefoot in good soil, picking sun-warmed tomatos. Taking a bite of one that is hot from the sun and getting the blast of flavor that defines summer is a glorious experience. If you haven’t been there, you don’t yet know the meaning of life. (Take a salt shaker in your pocket.) If you have kids, you owe it to them to visit a produce farm and share that experience with them. A sun-warmed strawberry works, if you have time next weekend. 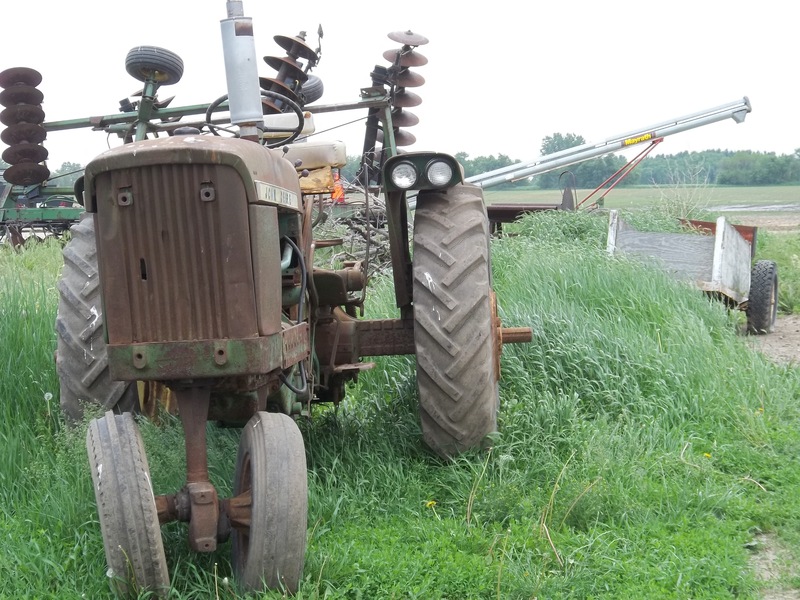 Click on the link to Wiltse’s above and to the right, you can view a list of what is ripe and for sale in each month, pending Mother Nature’s cooperation. If it is convenient to you, Kate is starting a booth at the Sycamore Farmer’s Market on Sunday, too. Kate has been a firefighter and paramedic for the last 12 years. She is also helping to raise two energetic boys with her husband. She and her hubby bought a 5 acre farmette (because they weren’t busy enough?) across town on the other side of Maple Park. There, they raise chickens for eggs along with miniature donkeys. (Did you get a mental picture there?) I wish I had a picture of a miniature donkey for you, but there was a storm whipping up and Kate was busy and they were on a different property. Kate is on a waiting list to get fainting goats. Perhaps I can manage a mid-faint photograph when the time comes to make up for the lack of a miniature donkey. We then walked out to the field behind the greenhouses. Kate showed me the row crops she has planted, most listed above, so I won’t repeat them. I love the Bibb lettuce alternated with red leaf lettuce. I hope you like this picture with a neighbor’s barn in the background. I had to lie on my glistening belly in the dirt to get it. We talked out in the field for a bit, both of us keeping an eye on a storm front headed our way. The fields needed rain again, but no one in the Midwest needs wind or lightning these days. About that time the wind began blowing like it meant business, and the thunder and lightning was getting close. Kate had to tie down the important stuff before the storm hit. I have sinned a time or two, so it’s best I don’t stand out in a field for long in that kind of weather. I thanked Kate for her time, put my purchases in the Guzzler, and raced the storm. The storm won, but the Guzzler is the cleanest it’s been in a while from that downpour, so I can’t complain. 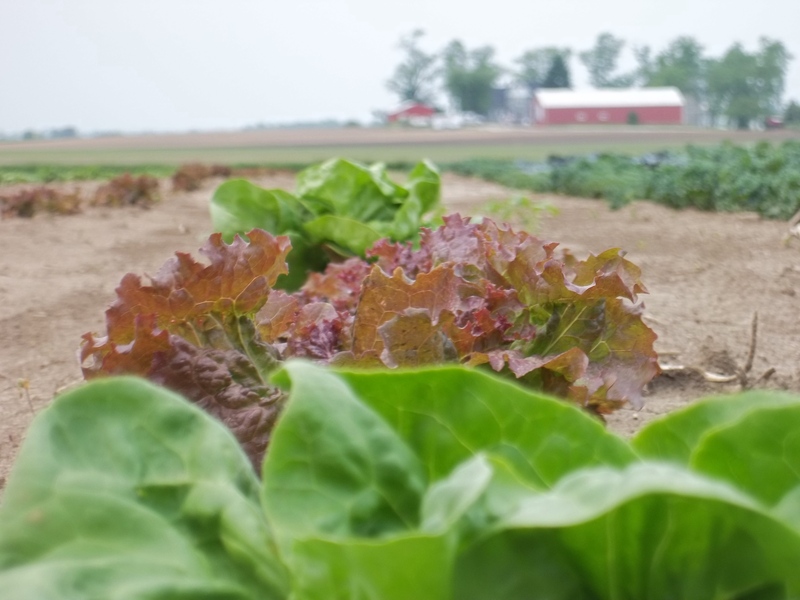 You deserve a treat – drive on out Route 38 for a fresh produce, flower-filled farm adventure and help another local farmer stay in business. Tell the Wiltse’s the Mental Farmer says hello. Thanks, B. That means a lot! Glad you enjoyed it. I’ll have to get the specifics on the City markets. You just gave me an idea, though, to add a list of Farmer’s Markets to this site. So thanks! What a beauty of a place to buy dill! who gets to name new varieties! and how well you write and put it all together. It is a terrific place to shop! Let’s make up some names for tomatoes and descriptions and I’ll post them. We can pretend at least! Thanks for the kind words, J. It was funny, right after I left Wiltse’s my sister called me. She was making dinner and her newly purchased grocery store dill was rotten. She had just sent her husband out to find fresh dill. Too bad she was 700 miles from me! I could have set her up. The rabbits must be driving you crazy. I know it sounds odd, but human hair in the garden seems to repel them. My salon saves it for me. The rabbits don’t like the odor of us people. Good luck! Wiltse’s is definitely following family tradition, it’s in their heritage. As a Maple Park resident I would also like to acknowledge Maries brother Jim who worked the land with her, after the loss of her husband, and brought the knowledge of farming that has helped Wiltse’s be what it is today. Never forgotten a man who definitely left an imprint on my life. A family deep rooted in family farming for generations. It’s nice to see a little bit of Jim still out there. Thank you, Faith. It is nice to get a comment from someone who knows the family and the community. I think that tradition is so important. Wendy, Thanks for the kind words. I wish you had been there, it would have been fun. Maybe we can meet for a drink again one of these years. I’ll meet you have way, in South Carolina! M.